Chess. It's not my game, I've only dabbled with it, but I do dig fancy chess sets. Especially ones that are handmade or themed. I once saw a set that was themed with fantasy heroes vs monsters, that was cool. There was another set that was angels and demons too, which was pretty awesome. But, I've never really thought about doing anything similar, until I was talking to my buddy, Matt, about Imperial Assault and he asked if it was a chess set. That planted the seed. Based off of the conversation with Matt, I thought about doing a Star Wars one using models from the Knight Models line of minis. But before I could even get any research into it, the Star Wars idea morphed into using Warhammer 40k instead. Warhammer 40k, as well as it's fantasy counter part, lends itself to the chess idea so well. I really like the universe and am a fan of Space Hulk, and the video games Dawn of War II, Kill Team and Space Marine. It already has various predetermined factions, which all have famous character models and different ranks of soldiers built in too. It just screams, chess-a-size-me. That's when the idea bit down and didn't let go. I did learn later that there is an actual in-universe chess style game called Regicide too, how about that? Originally, the first thing that came to mind was to use Ultramarine Space Marines and Chaos Space Marines as my two factions. It seemed logical, and seemed to fit the idea of chess and light vs dark. Plus Ultras are the most recognizable Space Marine faction out there and I really liked the Calgar model for the King. But after calling on the #warmongers on Twitter, the idea of using Space Marines vs. Tyranids came up, due to the suggestion to use one of the current box sets as a basis. The box set in question is the Shield of Baal: Deathstorm set, which contains Blood Angels Space Marines and Tyranids. This was a great idea, especially since I'm already a big Blood Angels fan, more so than I am of the Ultramarines. And the Tyranids are a wholly different faction, compared Chaos Space Marines. Plus, other than carapace/skin tones there isn't any extra research involved in order to keep things "canon". And since it's less of a mirror match, it would make the set more impressive and less basic chess. The project isn't going to be cheap though. Even with the Shield of Baal set, I still need to buy a few pieces that aren't in the set. Mostly Blood Angels, but a couple extra Tyranids as well. Not to mention a bunch of extra 50mm bases, so I can make them all uniform. Plus I'd still need to build the chess board. Of course, the chess board itself isn't going to be a plain flat board either. If I have my way, it'll be as fancy as I can manage. The board itself will be gridded out, like a normal board, but the spaces will be terrained out with cork and heights will vary across the area. The plan is to make it a box with a removable top and the lower section will open up for storage. The storage area will be lined with felt or fleece to allow the models to rest on a soft surface. That way, if I ever need to transport it somewhere I can easily carry all of the pieces inside itself. But, 99.9% of the time, I can guarantee that it'll will be set up on my coffee table in display mode. Blood Angels Chapter of Space Marines. 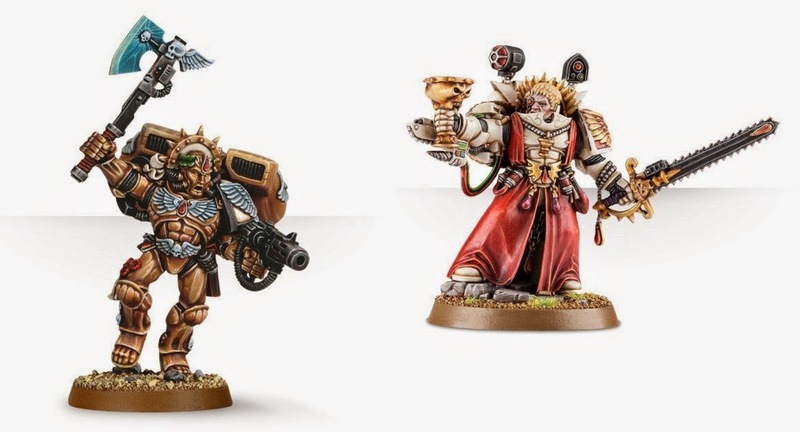 was deciding which Chaplain to use and what to use for a Queen. But once I saw the Sanguinary Priest, I knew he needed to be the Queen piece. Originally, I was going to use Chapter Master Gabriel Seth for the King. But then I realized that he was the CM of the Flesh Tearers Chapter, and not Blood Angels. Since I am staying strictly Blood Angels, I ended up having to go with Commander Dante instead, the true CM of the Blood Angels. The Tyranids were a lot harder. Other than Genestealers, I don't know a whole lot about them and how their different species rank. I knew that I needed the Shield of Baal Broodlord for the King, but couldn't decide on a Queen, and finally went with a Lictor. 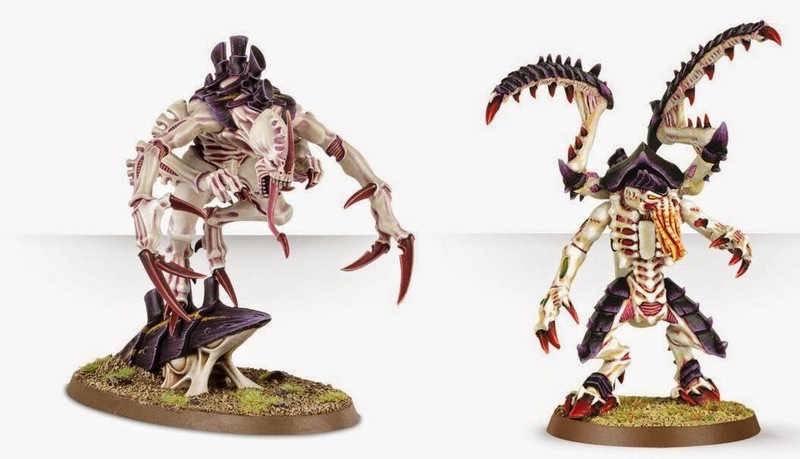 The Genestealers from the box set will become the Pawns and the Tyranid Warriors (also box set) will be the Rooks. I wanted some variety in their force, so I went with Gargoyles for Knights and Zoanthropes for Bishops. Originally, I was going to go with 40mm bases on everything. But the Tyranids have a lot of larger models that come with 50mm bases and I worry about them fitting on the smaller bases. Some of the smaller models might end up looking odd on that large of a base though. But, that's what terrain work is for, which isn't a deal breaker. Luckily, I'll have extra Space Marine and Tyranid body parts left over, so I can use them as corpses or lost limbs. There are also other misc pieces in my bits box that I can use if need. The larger base sizes only adds 2 inches to the overall board size too, so it'll only be a little larger than I was originally planning. I'm hoping to get started on collecting all of the parts soon. The box set I need is kind of a limited edition, from what I gather, and will need to be picked up sooner rather than later. That means that as soon as I have the funds available, I'll need to get a copy coming. After that, it's just a matter of picking up the rest of the pieces I need, as I can and as they are available. If I have to pick up used models, that's OK too. I may actually start hunting eBay and looking for deals. Especially on things like the Zoanthropes... those guys are spendy. Either way, this one is going to be a marathon project, instead of a sprint. It won't stop me from finishing the museum piece either, since I need to collect parts. It kind of reminds me of when I was building my arcade cabinet. Lots of planning and slowing picking up parts, then a whirlwind of work.